When I was working in Newport, Rhode Island in the Mansion by the Ocean, one night a week we would do a huge speakeasy performance. We blacked out the windows and served booze in teacups. We really did it up right. We even had an amazing seven piece Jazz band. All of the characters in the show were real prohibition era stars. 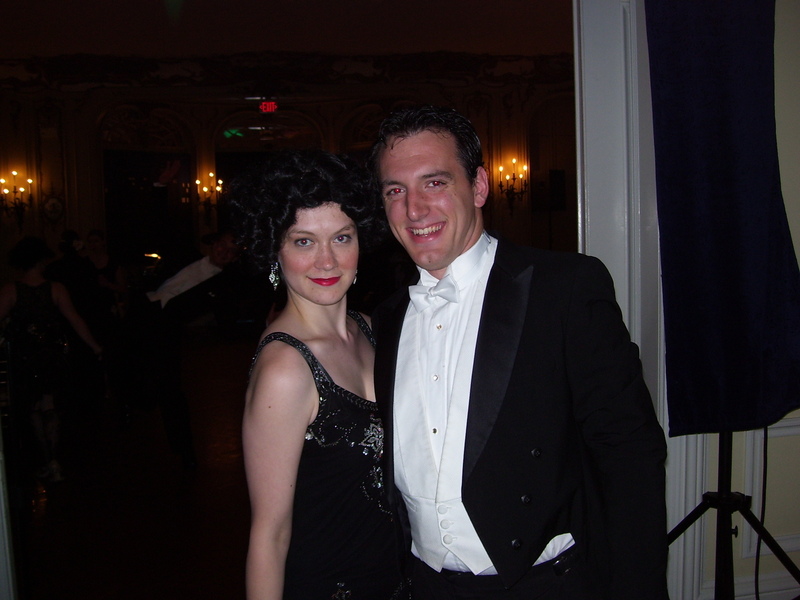 My husband played Cole Porter, and I played Louise Groody who was the original “No No Nannette” on Broadway. My big number was “Tea for Two.” The story was that my dance partner hadn’t shown up, so all the boys were competing with each other for the right to dance with me. And I looked fabulous! I had a gorgeous, beaded flapper dress and the sassiest black, curly bobbed wig. One performance I was doing my soft shoe and everything was going perfectly well. One of the boys stomped on my foot right on cue. I ducked under his arm and snuck away ramming my head into the stomach of my next would be partner. The audience laughed, and I smiled and went to stand up. But I couldn’t move. My beautiful black curly wig had gotten stuck on his pants button. My face was trapped next to his fly, and I was standing in the center of a ballroom filled with people who were expecting me to dance, not do dirty things with this guy’s pants. The audience was laughing, still thinking this was somehow part of the show. I tried vigorously to pull my head away, which only made them laugh harder. My dance partner was trying to help by grabbing my head, but that only made the whole thing look worse. Finally, in an act of pure desperation I grabbed my wig by the base of the offending curl and yanked. I was free! But my poor curl had been left behind, hanging sadly from my partner’s nether regions. We finished the number, me laughing myself to tears. As soon as I was done with the number I fled to the hall where I collapsed into a crying/laughing mess. They brought me a “cup of tea” to calm me down before I had to go back onstage. My wig was salvaged with a bit of restyling to cover the bald spot. My partner had to be taken out of his pants by our wardrobe guy. For some reason the fly wouldn’t work. Yeah, right. Thanks for the first belly laugh of the day. Laughter is great medicine. What a hoot! I think I would have slugged 2 cups of tea.